Non Parametric Statistical Tests were just added to Statistics Made Easy package for the TiNspire at www.TiNspireapps.com . 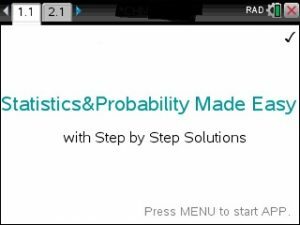 Just enter the given data and watch step by step how the p-value is computed so that you can draw your correct conclusions. What is particular nice about using these tests , like for the parametric tests too, once you change 1 or 2 data points you can immediately see how that change influences the final conclusion. So, no reentry of all the data is needed, just a little tweak.